Ok, it’s late, I’m tired, and I’m ready to get some sleep. Andy and I have been exploring all day, driving north from Phoenix with stops in Black Canyon City, Cordes Junction (to check in at Arcosanti), Montezuma Castle National Monument in Camp Verde, and Sedona. I have about 255 photos from today that I’ve offloaded from my camera to my laptop, and I’ll be ready to start shooting again in the morning as soon as my battery is charged (both the camera battery and my physical one). However, I couldn’t resist cranking out one HDR just to see how it looked. 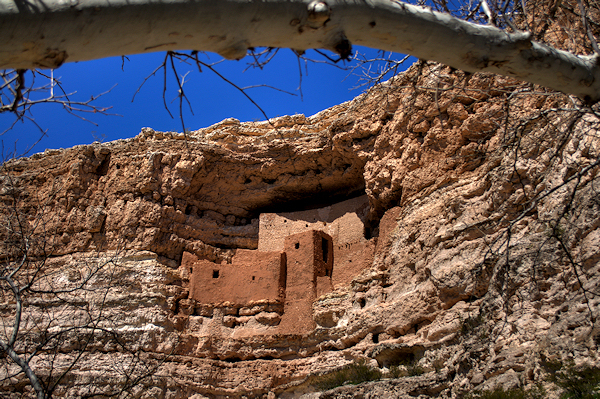 This is a shot of Montezuma Castle. It was a beautiful spring day with bright blue skies. The trees are still mostly bare, but I love the way the white bark of the sycamores echo the white of the stone in the cliffside. This is one of my favorite sites to visit in Arizona. I can’t imagine living in that day and age, in that lifestyle…having to carry everything up the cliff face via a series of wooden ladders. I wonder how many little kids accidentally took a tumble from up there when they weren’t watching what they were doing? I just can’t imagine how they even came up with the IDEA of living in the cliff face. I’m sure I’ll be processing photos from today for the next several weeks, not to mention the additional ones I anticipate getting tomorrow from here at Arcosanti. We’re having a great time being “tourists” in our great State!! This entry was posted in Shooting and tagged archaeology, Arizona, AZ, camera, D5000, HDR, Montezuma Castle, National Monument, native American, Nikon, Paint Shop Pro, photography, Photomatix. Bookmark the permalink. Beautiful HDR! I like the view of the building embedded in the rock, plus it doesn’t look fake like most overworked HDR images tend to do. Great job!